Claire is 19 months old and a survivor. She made it through the frigid cold spell in Milwaukee last month, but just barely. A good Samaritan spotted her outdoors on Jan. 23 and called the Milwaukee Area Domestic Animal Control Commission (MADACC). The shelter dispatched an animal control officer to bring her to safety at the Commission’s 3839 W. Burnham St. building. 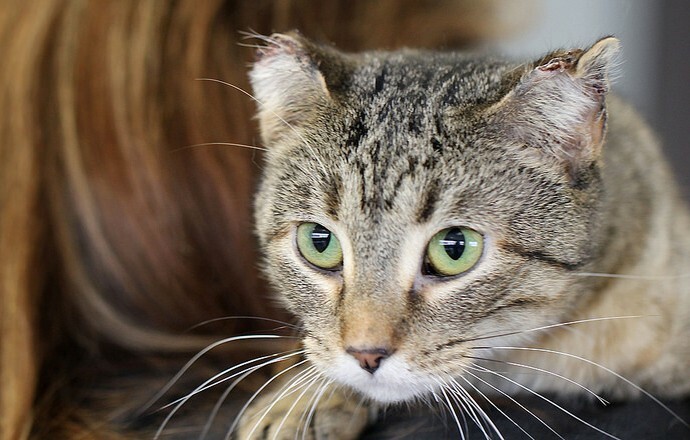 There, she receives medical treatment because her ears were frozen. 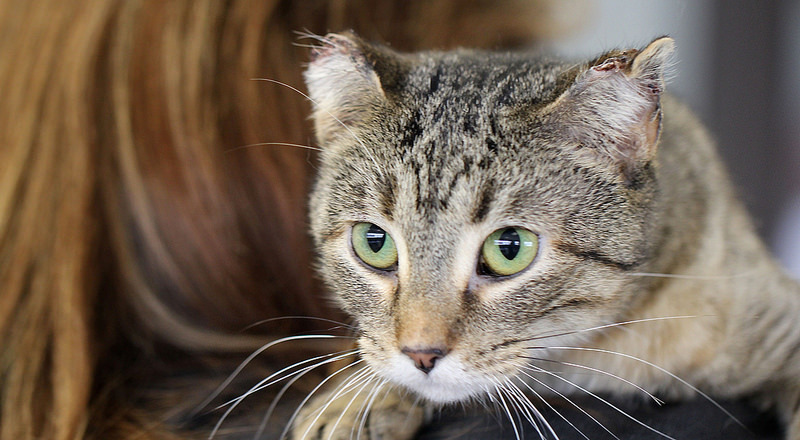 Claire is one of about 12,000 animals who find temporary housing in the county’s shelter each year, which is open to those who are abandoned, stray, neglected and mistreated. The extreme cold in January did not lead to a greater influx of animals, according to MADACC spokesperson Laura Nigbur. But she said more of those coming to the shelter needed medical attention. Problems at this time of year, Nigbur said, range from hypothermia to frostbite to frozen or swollen footpads to burns. The burns occur, she said, when stray animals go looking for heat. Jody Clemens, a practice manager at the Advanced Animal Hospital at 3374 W. Loomis Rd. in Greenfield, described the signs of frostbite. “The animal’s skin turns gray and then red as it warms up,” Clemens said. In severe cases, the tissue turns black and dies. She added that there are no home remedies for the problem. Claire arrived at the shelter exhibiting frostbite symptoms, according to Nigbur. And her case is severe. 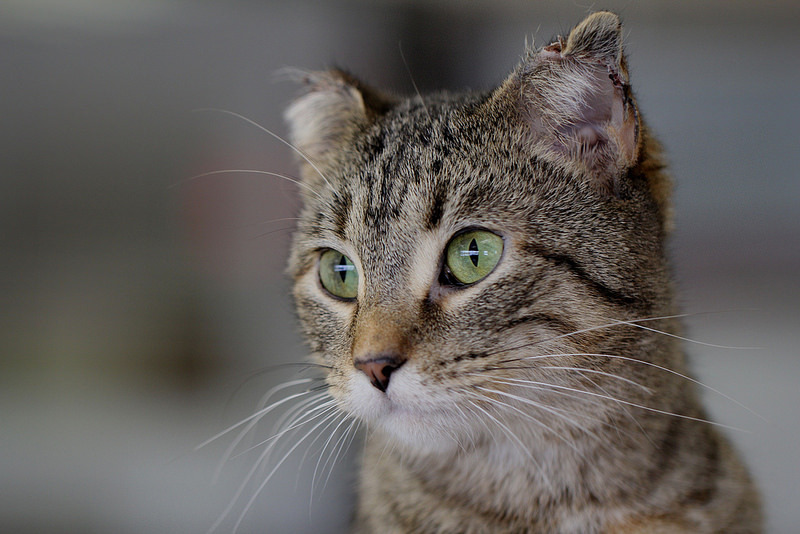 She has lost the tip of one ear and is in the process of losing the tip of the other. Clemens cautioned pet owners to be on the lookout for signs of exposure that can include behaviors not normally exhibited by pets. Biting or licking extremities is one signal, while head shaking, and area redness and soreness are others. A sick cat will often hide, she said. Pets react to cold the same way humans do, but breeds differ in the amount of cold they can tolerate. “Some dogs are bred for cold weather,” Clemens said. A huskie might be able to stand 10 minutes or more of frigid temperatures while a chihuahua might last only two minutes. Claire is one of the lucky ones this winter. Nigbur said animal control officers were unable to rescue all of the animals that needed help during the January cold. “A couple… were left outside too long so our control officers found them deceased,” said Nigbur. When abuse or neglect is suspected, the agency will work with the police. Penalties vary, according to Nigbur, depending on severity of injury and the owner’s intent. Nigbur pointed out that purchasing a license and having a computer chip implanted in a pet can help MADACC reunite lost animals with their owners. Meanwhile, no one has stepped forward to claim Claire, who is healing quite nicely, according to Nigbur. She described the cat as curious, playful and often purring while she is held, all signs of a “well-socialized” animal. So, as is the case for most of the animals temporarily housed at the shelter, Claire, the brown-tiger colored cat, will soon be looking for a new home. Where do I go to adopt Claire? She looks like she could be my cats sister.